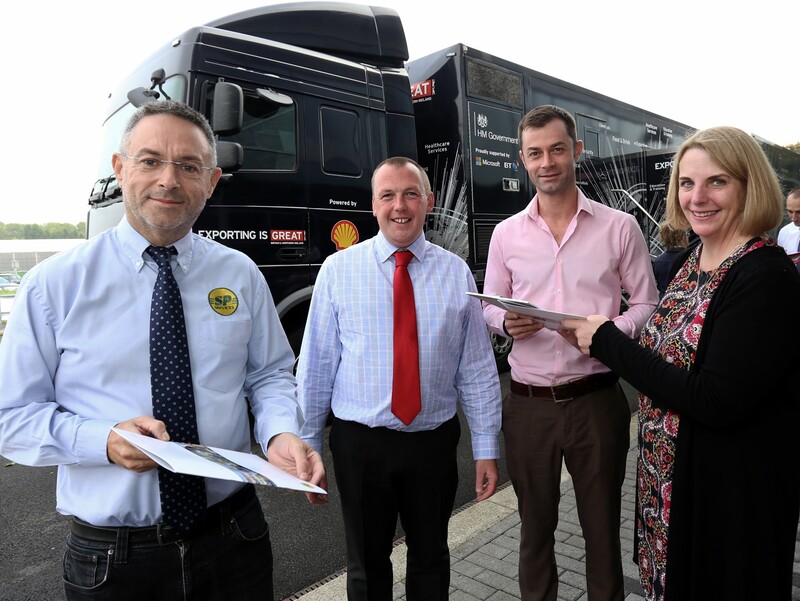 SP Services MD Steve Bray with colleague Paul Watts, Patrick McCarron from the DiT and Chamber of Commerce trade advisor Christine Armistead. A UK medical equipment supplier demonstrated its global reach as part of a campaign to support the Government’s Exporting is GREAT campaign. Paul Watts, Head of International Business Development at SP Services, spoke live via a huge screen to a dozen members of a Dubai sales team and a company executive in twin locations while also connected to a marketing manager from his hotel in Pakistan, where he was on holiday. Standing in the deluxe conference suite inside the Government’s giant 21m long, 32 tonne campaign truck, Paul spoke to his Middle East customers in the transatlantic Skype call to show how it was done. He demonstrated to the Middle East medical supply team, his company’s range of bespoke medical bags, which are used by fire, ambulance and police in the UK and across the world. The export event, attended by business leaders, also featured an innovative Brayden CPR mannequin being distributed by SP Services to hospitals and healthcare facilities in the Middle East. Dr Jonathan Smart was introduced by Paul Watts who spoke to the Middle East delegates from his Hampshire office, via the DiT export Hub in Telford. Attending the DiT Roadshow at SP Services Telford HQ in Shropshire was John Butterfield, who trains paramedics and supplies medical equipment in Libya, the Bahamas and Middle East. “There are big world trade opportunities out there post Brexit,” said John, a former owner of a private ambulance company, who attended an export ‘masterclass’ held during the export event. Also at the event was Warrant Officer Paul Edwards, seconded to the DiT’s export support team, to link UK medical suppliers to wherever they are needed in the world for humanitarian aid, defence and security. “We help promote goods and services from SMEs for export,” he said. The Department of International Trade Roadshow is part of a move to get 100,000 additional UK companies exporting by 2020. The Roadshow has been to football clubs, town halls and business centres in more than 100 towns across the UK since it set out in November 2015 to export it’s Exporting is GREAT message. “Exporting is GREAT is the Government’s most ambitious export campaign to date and hosting the Hub at a successful international businesses like SP Services offered us an unmissable opportunity to open our doors to other businesses in the local area that also want to start exporting,” said a spokesperson for the Department of International Trade.